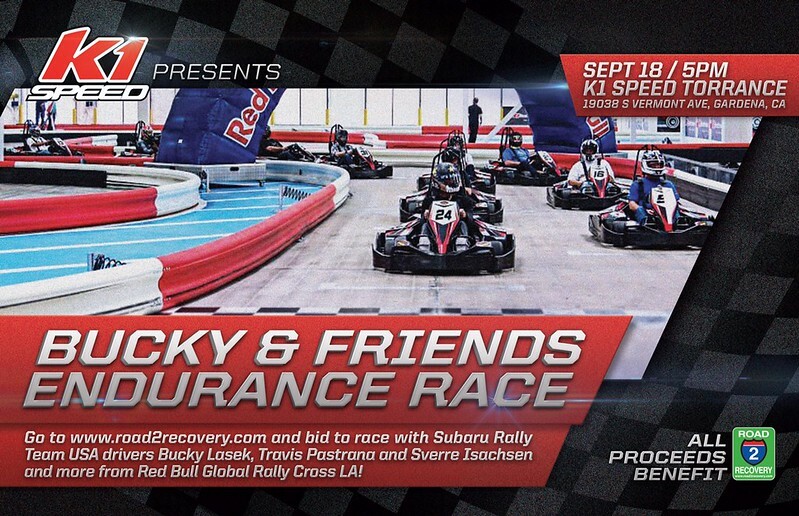 Carlsbad, CA – September, 14, 2014: K1 Speed and Subaru Rally Team USA are hosting an endurance race fundraiser for Road 2 Recovery just before this year’s Los Angeles stop of the Red Bull Global Rallycross Series. All the racing will happen at K1 Speed Torrance on Thursday September 18th. Visit www.road2recovery.com and bid on a chance to be on a team or drive against Bucky Lasek, Travis Pastrana, Sverre Isachsen, Patrik Sandell and more from the Red Bull Global Rallycross ranks. There will also be spaces available the night of the event to participate in the endurance race but get there early to guarantee a seat. Road 2 Recovery will host raffles for great prizes and memorabilia plus the top three teams will be receiving trophies and ultimate bragging rights. There will be some interactive activities and amazing cars on display from Subaru so don’t miss it! All spectators are free to attend and this is a really fun karting experience and a relaxed way to meet and hang out with some of the top drivers in the world or Rallycross. All proceeds will benefit the Road 2 Recovery which is a 501(c)3 that assists action sports professionals when they suffer a career ending injury. Pro drivers will start to arrive by 5:00 pm and the endurance race will run from 7:00 pm – 9:00 pm. Don’t forget to visit www.road2recovery.com for your chance to race on one of the teams! Mission Statement: To provide financial assistance to AMA licensed professional motocross/supercross riders and action sports professionals in the event they sustain career ending injuries. Alongside the professionals the Foundation is dedicated to providing emotional and spiritual support to the families. Continue acting as a pathway for the action sports public and its supporters to donate funds to be issued to injured professionals.